St Hilda’s Boarder Parents have commissioned a special piece of art by St Hilda’s Old Girl Felicity Grant, depicting St Hilda’s valuable Davenport and Shelly China collections. There are 100 limited edition prints available and already a third have sold. As a special memento of St Hilda’s School, order your limited edition print via Parent Lounge now. ‘St Hilda’s High Tea’ by artist Felicity Grant symbolises the sense of belonging and ceremony that comes from sharing time together. The work also celebrates two very special pieces of china that have historical significance to St Hilda’s School. 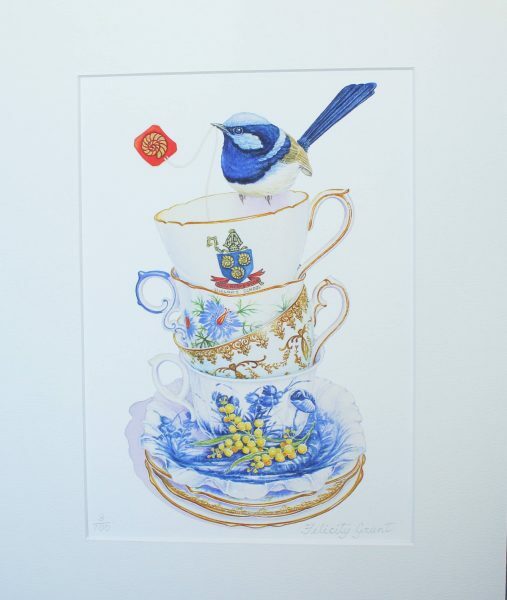 Featuring a collection of four china tea cups and saucers which tie together the past with the present day, the painting incorporates the beautiful blue china from Miss Helena Davenport’s antique tea service (circa pre-1899), an Aynsley tea cup and saucer (c. 1950-1952), a Gladstone tea cup and saucer (c. 1946-1961) and the Shelley china set with the St Hilda’s crest (c. 1920-1930). The sprig of wattle represents the Australian countryside – as well as making reference to native plants of Australia from which the pastoral and sporting houses of St Hilda’s are named. The quirky fairy wren, with the gold-leaf Ammonite tea bag tag dangling frivolously from its beak, provides a hint of fun at St Hilda’s, as well as symbolising the gorgeous young ladies attending the school today. Miss Helena Davenport emigrated from England in 1876 and her vision in founding the Goyte-Lea girls’ school in Southport set in motion the foundation, upon her retirement, of St Hilda’s School. In return for her bequest of the school to the Church of England, the school purchased Helena’s antique china service and gave her a stipend (allowance) until her death in 1935. The hand-formed and hand-painted raised blue china tea service is believed to have been made in the 19th Century and be of Japanese origin. No two pieces of the china are exactly the same and whilst the service has no formal name or markings, it is fondly referred to at St Hilda’s as the ‘Davenport’ China. The St Hilda’s crested Shelley tea cup features the school crest and motto ‘Non Nobis Solum’ (Not for Ourselves Alone) and is just one of many tea services commissioned for St Hilda’s School. These pieces were used as gifts and prizes from the 1920s in recognition of outstanding service to the school. Both the ‘Davenport’ and St Hilda’s crested Shelley china collections are displayed in the Trophy Room adjacent to Boarders’ Reception at St Hilda’s School. Felicity Grant (née Thelander b.1960) is a renowned Toowoomba artist who was raised on her family’s sheep and cattle grazing property near Talwood in South West Queensland. Felicity was home-schooled by her mother before attending St Hilda’s School as a Boarder from 1971-1977.